When people talk about alternative forms of transportation, one usually thinks of trains, bicycles, or buses, but here in Karachi, walking is the one mode of transport that is often overlooked. As public transportation and privately owned vehicles find themselves banned from using certain roads, transporters and the general public have raised a number of complaints, but to no avail. Q. 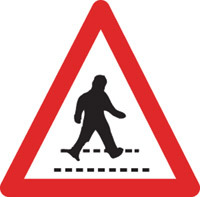 What do the following traffic signs mean? Suraiyya Hamid had never wanted to send any of her children away to a cadet college, but her husband Dr Hamid Maqsood would not budge. His decision was cemented back in the 1930s when one of his cousins, the late Dr Hassan Ashfaq Siddiqui, spent a number of years at Sherwood College Nainital. It is a nostalgic time for Altaf Shaikh, renowned writer and chief engineer of the ship Motor Vessel Malakand (M. V. Malakand) that has been beached in Gaddani for scrapping. "It has to do with the philosophy of development," says Tanveer Aslam, a regular pedestrian who prefers walking to and from his workplace located at a short distance of three kilometres from his home. "In this entire process, we are trying to replicate foreign models of flyovers and underpasses and have signal-free corridors now where cars keep racing by pedestrians. It seems the government's priority is to facilitate motorists, with pedestrians shoved aside." With the safety of pedestrians seeming to be last on the list of priorities of planners and managers in the traffic department of the City District Government Karachi (CDGK), Aslam's view is one that is shared by many others who have suffered in the name of development. But some argue otherwise. "Approximately two million vehicles come on the roads of Karachi everyday, and in order to keep the traffic in circulation, signal-free corridors were essential for an urban city like Karachi," argues Saeed Akhter Rizvi, DDO Transport and Communication Department CDGK. However, it is not just motorists who use the roads of this mega city. More than four million pedestrians also come out on roads each day, and with a lack of facilities for pedestrians, the number of those injured or killed has also increased. According to an official estimate by the Transport and Communication Department CDGK, between 2007 and 2008, there has been a slight rise in the number of pedestrian casualties. Statistics reveal that out of the 655 deaths from Road Traffic Accidents (RTA) in 2008, 289 were pedestrian casualties, compared to 285 out of 618 in 2007. But according to an official at the Road Traffic Injury and Prevention Centre (RTIPC), a project initiated by Dr Rashid Jooma, Professor of Neurosurgery at the Jinnah Post-Graduate Medical Centre (JPMC) in collaboration with the NED University and Aga Khan University Hospital (AKUH), official data shows only the tip of the iceberg. The RTIPC conducts a yearly survey of RTA victims at five major hospitals of the city and maintains a detailed record which the government departments are unable to do owing to a shortage of staff and funds. These hospitals include Liaquat National Hospital, Civil Hospital, Abbasi Shaheed Hospital, JPMC and AKUH. "Our study reveals that compared to 2007, road fatalities have increased immensely, with pedestrians constituting a sizable proportion of road accident victims in general," Syed Ameer Hussain, Programme Manager RTIPC, confides in Kolachi. However, he could not share the exact statistics, as a detailed report of road traffic accidents of 2008 has yet to be made public. "High-speeding traffic on signal-free corridors has made matters worse," continues Hussain. "There are not enough overhead pedestrian bridges, which makes pedestrians very vulnerable. One such black spot is the Mauripur Road, where pedestrian fatalities are high owing to speeding heavy traffic and lack of overhead bridges by the National Highway Authority." 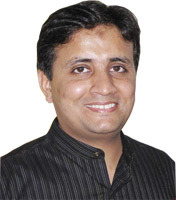 When questioned, Muhammad Athar, the Project Director of Pedestrian bridges and Bus Stops for CDGK, explained that when the idea of signal-free corridors was proposed, the construction of simultaneous overhead bridges was part of the plan, but a shortage of funds in the department delayed the process. "The government has installed eight pedestrian bridges along signal-free corridor-I while two more are under-construction. Similarly, nine pedestrian bridges will be built on signal-free corridor-II that stretches from Nagan Chowrangi to Surjani Town and seven on signal-free corridor-III stretching from Saddar to Safoora Goth. 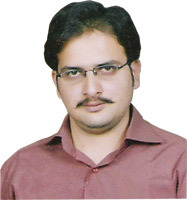 We are now nearing the completion process and they will all be ready by April 2009," promises Athar. But bridges alone will not solve the problem. Since the jurisdiction of different parts of the city lies with various civic agencies, most pedestrian bridges, even if installed, are of varying designs that cause inconvenience to pedestrians. One can observe the difference between pedestrian bridges installed in the cantonment areas and those within the jurisdiction of CDGK. "Apart from inconsistencies in the size and design of the bridges, there is no standard distance between two pedestrian bridges that the authorities consider before construction," points out Hussain. It is a fact Rizvi agrees with. "We do not take into consideration a minimum or maximum distance before building overhead bridges because there is no need to," he says. "Bridges are constructed after our team conducts a survey of the area from where we receive most complaints of a high volume of pedestrian traffic." In the case of Fazal-e-Elahi Road (also known as Road-5000), for example, the CDGK has installed six pedestrian bridges along the road which connects Nagan Chowrangi to Surjani Town. "Since it is a commercial area and our survey revealed that pedestrians face hardships along the road, we installed six bridges." But on the other hand, this absence of a standard procedure has compounded problems on streets like Share-a-Faisal. 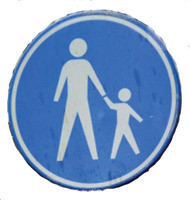 Large distances between pedestrian bridges compel pedestrians to risk their lives as they cross the busy corridor. In some cases, people are forced to opt for rickshaws to cross the road and as well. Some other complaints received by the pedestrians Kolachi spoke to include the absence of ramps for the disabled and senior citizens on most bridges. "Why didn't the government take them into consideration before planning these bridges?" asks Iqra Zaheer, a student of the University of Karachi. 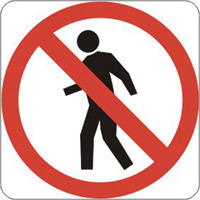 Zaheer condemns the government for treating pedestrians like "second-class citizens", and suggests that even in the presence of signal-free corridors, there should be certain spots marked with zebra crossings for pedestrians. Often, however, motorists fail to respect such areas and treat pedestrians as obstacles, such as along the zebra crossings on Shahrah-e-Faisal and University Road, Gulshan-e-Iqbal. But more than being unable to cross roads, pedestrians feel that their right to walk on pavements is also being violated. Many pavements in the city are shrinking so that roads can expand to accommodate motorists, pushing aside the concerns of pedestrians or cyclists. The little space that is left to walk on is often encroached by vendors (in areas like Saddar) or by motorcyclists who illegally drive on pavements. They are never fined. "I have no reported case of any motorcyclist being fined for driving on a pavement yet," confirms Masood Shah, Reader to DIG Traffic Sindh. As if that is not enough, the uneven surface of pavements, the poor quality of tiles, and open man holes, further expose pedestrians to dangers and discourage them from walking. During a recent visit to Karachi, Enrique Penolosa, former Mayor of Bogota, pointed out that the denial of pedestrian walkways is a serious violation of human rights, and that the road space in every city needs to be distributed equitably. Penolosa is of the opinion that the expansion of old roads or construction of new ones does not reduce traffic jams, but actually increases traffic flow as better roads encourage the traffic to go further and travel long distances. That is why the solution for urban cities like Karachi lies in mass transport, not more flyovers, he suggests. Athar, however, denies all such allegations. On the contrary, he says that pavements have actually been expanded and upgraded according to 'American' standards, and highlights the facilities available on Rashid Minhas Road by way of example. However, critics argue that this city should not be replicated along foreign lines. "Our traffic planning and policies should be designed keeping our local requirements in mind instead of borrowing ideas from the West," stresses Aslam. "If a poor man walking on the streets of Saddar enjoys purchasing stuff from roadside vendors, we should not discourage him from doing so by ridding the city of encroachments. Instead, pavements should be planned or expanded so that vendors are officially allotted some space and issued a license to run their business in a way that does not affect pedestrian traffic." Despite the views of pedestrians, Rizvi is insistent that the government is trying its best to facilitate them, and adds that they (pedestrians), too, have some responsibility. "Our survey has revealed that even where we have facilitated pedestrians with sidewalks, bridges and zebra crossings, people remain ignorant or simply avoid using them and are at risk of being hit by a speeding vehicle. We need to educate them about road safety and traffic rules as well," he says. But before any of this can happen, Hussain of RTIPC is adamant that all stakeholders first need to come together to recognise the rights of pedestrians and work towards implementation of traffic laws. "The unstable law and order situation has been a big reason for restrictions on certain arteries of the city," states Shamim Akhtar, Secretary Regional Transport Authority. "Things would be different if the security situation was better." To ensure security for foreign missions and diplomatic enclaves, all forms of traffic has been blocked on Fatima Jinnah Road beyond Cantt. Railway Station, where the PACC, the American Club, and the residence of the American Consul General are all located. As a result, the routes of the buses Star Line, Number 20, Ilyas Coach, Muslim Coach and 11-C have been affected, and the general public is left with no way of reaching Frere Hall, a heritage site. "Since the ban on Fatima Jinnah Road we have to take a round trip to get to Shaheen Complex," complains Mahmood Khan Afridi, General Secretary Karachi Transport Ittehad. "Moreover, now the route of the mini bus D-3 in the airport area has gone up by two kilometers. Our fuel consumption has gone up, and we are suffering losses." Similarly, for security reasons, public transport, motorcycles and even vans are banned along Abdullah Haroon Road from Clifton Bridge to Metropole Intersection in the vicinity of the American Consulate and the Marriott Hotel. Citizens now have to walk long distances to reach offices located along the road. Pedestrians are interrogated by the security personnel, and complain that crossing the road has become akin to passing through a border crossing. But it is not just public roads that have become off-limits to many. Many private houses and even residences have begun to cordon off roads for their own convenience, such as Razi Road, PECHS near Fedex office, a road in Block-C North Nazimabad and a road near the Aga Khan Community Centre, and the road leading to Bilawal House. "Can a private residence be converted into a presidential house?" an irate resident of Clifton, who lives near Bilawal House, demands to know. The road remains blocked even when President Zardari is not in town. "It is extremely difficult to commute in the area when there is a lot of traffic, particularly when the President and his security personnel or any visitors are in town." The ill-planned strategies of the civic administration can further be judged by the ban on public transport along I. I. Chundrigar Road, despite the fact that in most cities, public transportation has complete access to the city centre. Several buses and coaches have to be diverted to the already overburdened M.A. Jinnah Road, even though it has been noted that public transport is given precedence over private transport on I. I. Chundrigar Road, where a majority of the city's offices are located. "Any decisions to ban routes of public buses are taken by the Transport and Communication Department of the City District Government Karachi, in collaboration with Traffic Police," explains Akhtar, although he, too, admits that the banning of public transport on I. I. Chundrigar Road serves no purpose. "He was an icon for the whole family," says Maqsood. "We all idealised his personality." 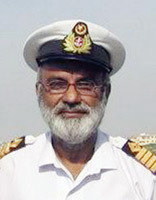 After completing his time at the cadet college, Siddiqui went on to achieve a degree in medicine and become the principal for six years of Bolan Medical College Quetta, the only medical college in Balochistan. 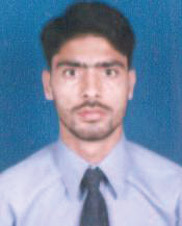 Siddiqui's professional success sealed Maqsood's conviction that a cadet college would be the best thing for his sons. "We had seen great examples of what cadet colleges did," says Maqsood. "Three of my nephews went to Cadet College Petaro (CCP). That institute brought their personality. Now all of them are doing very well in their social and professional lives." Still, it was not an easy road. Maqsood recalls that sending his first son to Cadet College Petaro was one of the hardest things he had ever done. "It was 1975. We were settled in Quetta, but we sent him to Petaro just so he could get quality education. It was very difficult, but I had six children - three boys and three girls. I was practising at the time and couldn't focus on them individually." Difficult though the decision to send his son away was, Maqsood maintains that it was the right one. By the time his second son was ready to leave home in 1987, Cadet College Mastung had opened up, and it was here that Maqsood sent both him and his last son. "I sent them there because CCP's reputation was declining, and anyway, we preferred to send our children somewhere close to home than to far-flung areas of Sindh." Maqsood's wife, however, is less inclined towards this drive for cadet colleges. "I was never in favour of sending them to boarding school when they were just 13," she told Kolachi. "You don't get the time to care for them properly. Only a mother can realise how difficult it is to live without her kids." In an effort to empathise with her children, she stopped using hot water the day her youngest son left home for a cadet college. "I knew he wouldn't have hot water available where he was going, so I stopped using it myself," she says. "It might sound insane, but that is how I felt." In hindsight, though, she does not regret the decision to send them away. "When I see my children and their children growing up and doing well in life, I never regret the six years they spent away from home." 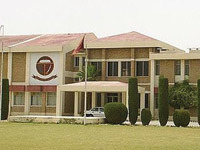 The unique thing about cadet colleges is that they attract people from all strata of society, and those who make the plunge have a stream of reasons to back up their decision. Tahir Mahmood, a microbiologist and teacher, sent both his children to cadet colleges, and like Suraiyya Hamid, he has no regrets. He says he would do it all over again if he could. One of the aspects that endeared him to the system him was how economical everything was. "Your children get quality food, a healthy lifestyle, good education, and adequate accommodation at very low cost, especially compared to the skyrocketing fees of private schools these days." More than the attractive cost of everything, though, was how the experience would mould his sons' personalities that convinced Mahmood. "I have always believed that a test of fire makes fine steel," he says. "For working parents like me and my wife, it is very difficult to properly focus on children and prepare them for real challenges in life." Those who have passed through rigours of cadet colleges agree. Mustafa Mahmood, a student from Hamdard College of Medicine Dentistry, has been living in Karachi independently away from home independently for the past 10 years. 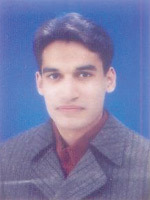 He was a model student at his cadet college, and was awarded a golden star of leadership. At the time, he had no idea how profoundly such an honour would affect his life, but he reaps the rewards today. "Today, be it at any event, I am always at the forefront." Before he went to a cadet college, Mahmood studied at The City School, and today when he sees the people he was with before, he is filled with gratitude that he got out. "When I compare myself to them, I know I am far ahead of them," he believes. Such is a common feeling amongst those who have studied at cadet colleges. Ahmed Ayub, an ex-cadet and currently head of the project management department at a software house in Karachi, maintains, "Whatever I am today is because of the time I spent at (that) cadet college." He does not deny that they were six difficult years. Each month, his parents would visit them, and each time when they would go back home, Ayub would hungrily watch the car until it would vanish from sight. Today, it has been 16 years since he left home. He is now settled in Karachi with a family of his own, and feels he owes his success to the time he spent at boarding school. "In my college, I was properly monitored by the teachers. They would keep an eye on you right from Fajr prayers until the time you slept," he remembers. Some may find such constant supervision inhibiting, but Ayub sees it differently. "Every student received individual attention, which I don't think happens at any other school. I entered the college as a below-average student, but because of my experiences there, I left as the second position holder in pre-engineering in the Balochistan board." However, although cadet colleges have played an important role in giving a new dimension to the educational system, not everyone is convinced that sending children away for five to six years is a good idea. "Sending your child miles away so he can become a tougher man is another way of ignoring him," says Dr Shakil Faruqi, assistant professor at the Department of Genetics at the University of Karachi. Faruqi is openly critical about the strict discipline cadet colleges are known for. Far from thinking that it toughens up the students, he firmly believes that the strict boundaries they must adhere to become mental barriers. "Whatever discipline is imparted at cadet colleges can be done at home if parents focus (properly) on a child's mental, physical and educational progress," he says and speculates that people admire a military environment because they believe it will turn their child into doctors, engineers, or soldiers. "I agree that students in boarding schools are more disciplined and punctual, but we always forget that such a closed military environment inhibits their thought process. It leaves them with a very narrow horizon. You should not expect a cadet college to improve the standards of education, because discipline alone can never improve education." It is true that fewer parents are willing to send their children away to cadet colleges, although their reasons are different from Faruqi's. Ahmed Ayub, a product of a cadet college, does not intend to do the same with his children, primarily because in today's climate, it is very difficult to enforce the discipline cadet colleges are so famous for. He is well aware of the attraction of defying orders as a cadet, and does not want his children to be similarly tempted. "Technology has progressed so much that a child can never have a proper boarding school environment," he says. "Cell phones are banned at all cadet colleges, but all cadets use them anyway to remain in contact. Who knows what else they could do? They could carry a portable DVD player with them and end up misusing all the gadgets they have." Even Maqsood, such a passionate supporter of cadet colleges when his sons were young, no longer feels they are good enough. "Their standards have declined, and rising ethnic problems amongst cadets have led parents in general to stop sending their children to cadet colleges," he says disappoint- edly. How has your experience in a Cadet College shaped you? My experience at a cadet college was great. One thing I can never forget to date is the Extra Drill (ED) we got as a punishment for breaking any rule. We would be made to stand in scorching heat without our shoes which was exhausting. Today whenever I think of violating any law, I recall that punishment and decide against it. I guess those countless EDs in college helped." My college has given me the vocational skills that I may not have learnt elsewhere. We had separate classes of Metal works, Wood works, applied electricity, calligraphy among others. Unlike most men, I can sew on a button and mend minor rips and tears in my clothes instead of running after someone to help me with it." I owe my entire life to my cadet college. As a spoilt child of my family, I never did well in studies but my teachers at the cadet college got me to study and laid a firm educational foundation. My years at the college brought discipline in my life and I still adhere to those rules that my teachers trained me to follow." I had to travel all the way from Balochistan to Sindh by train at the mere age of 13. Those independent journeys 30 years back have made me confident as an individual. Apart from that my college taught me to be tolerant as well as there were students from multiple ethnicities and social class in my class. I learnt to interact with people of different mindsets and also how to adapt to different environments." The concept of seniority at my cadet college taught me a lot. I understood the different chains of command both socially and professionally. The transition from a junior to senior cadet in Hassan Abdal taught me to respect those above me." Shaikh, who retired a few years ago, was actively involved with Malakand right from its inception nearly 30 years ago in 1980 and had the honour of taking the ship on its maiden voyage as chief engineer. But ever since learning that his beloved ship will soon be scrapped, he has started to look back wistfully at all the years he spent on it. "I have been chief engineer on many other ships, but like a favourite child, Malakand was always special," he says. He took charge of its construction and then sailed it as its Chief Engineer. In life, Shaikh has been more than just a chief engineer. A prolific writer, he discovered writing at the age of 18. Since then, he has written 68 books, with the first one, 'Anamika' (Bengali for 'Unknown') being published in Chittagong in 1966. His foremost career, however, revolved around ships. Shaikh first laid eyes on what was to become Malakand on a cool spring morning in Tokyo, where it was built in the Japanese shipyard Ishikawaharima Heavy Industries. Despite being born in New Hala, Matiari district on November 14 1944, Shaikh is fluent in Japanese, as well as English, Urdu, Sindhi, Bengali and Malay, and so had little trouble supervising the construction in Japan. "It was an interesting experience, working with the Japanese," he says, and fondly turns to all the special features of the ship. "Malakand was modern for its time, with most of the systems computerised." Shaikh remained with the ship the whole time it was under construction. The rest of the crew arrived from Karachi a day before it was to leave the shipyard, after which Malakand left Tokyo and anchored in the nearby port of Yokohoma. "On our way back to Karachi, we passed through the ports of Osaka, Nagoya, Pusan (South Korea), Hong Kong, Singapore, and Colombo," says Shaikh, and proudly adds, "The ship was admired wherever it went, both inside and out." As chief engineer, Shaikh made several voyages on Malakand, travelling to Europe, Africa via the Suez Canal, and to the Cape of Good Hope, often taking his family with him. He can claim with some authority that the harbour in Karachi was among the best in the world when he sailed the seas. "It isn't any more, though," he says, and remembers the time when two gallons of oil were mistakenly poured into the sea from his ship some distance away from the port in Tokyo. "A helicopter was on the scene soon after that. Our ship faced charges and we had to pay a fine, but here, there is no one around to keep a check on what is going on." Shaikh was 35 when he first took charge of Malakand, but today at 64, he feels as though it were only yesterday. "That beautiful ship was built right in front of me, but very soon, it will be in pieces, just like it was almost 30 years ago," says Shaikh as though he can hardly believe it. He is now retired, but by no means has he forgotten his sailing career, and nor has his family. While driving over Jinnah Bridge, his daughter Mariam points out a ship anchored nearby to her 13-year-old son. "I lived on that ship for a year with your nana," she tells him. "Soon it will be taken away to be scrapped." From the road out of the corner of his eye, Shaikh spots Malakand, which will very soon cease to exist. "I can picture them cutting it up," he says. And as he tries to concentrate on his driving, he gives in to tears. Altaf Shaikh may have had a very busy schedule on the ship, but he still managed to find the time to author 68 books, and he did it mostly by avoiding social baithaks. "I don't know why people in this country waste so much time socialising," says the retired marine engineer. After having travelled extensively to different coastal cities across the world during his service, Shaikh is keen to share his experiences with his readers so they can understand the diversity of cultures in different countries. "I used to write when I was a sailor too, but after I retired, I chose to devote all my time to writing." Shaikh's day starts at 4:00 a.m., which he says is the most peaceful time to pen his thoughts. "He also goes to bed early, which is why he is unable to socialise much," adds his better half, Mastoora Shaikh, although her husband refuses to accept such a description. "I actually stay in touch with my former colleagues and students over the Internet," he argues. "It's just that during my interaction with people from different countries, the one important lesson I learnt was not to waste the time that can be utilised to do something better. The reason most Western and South East Asian economies have prospered is because their nations have realised the value of time." In Shaikh's case, sharing his knowledge through travelogues is what constitutes is a better way to spend time. What makes this writer unique is that he does not accept royalties from his publishers, making his books affordable to the average buyer. Shaikh's writings have been acknowledged in Pakistan and abroad, and he has also won several literary awards. 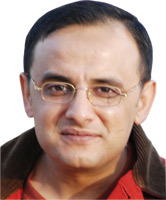 His latest book 'From New Hala to New York' recently won the Pakistan Academy of Letters, Islamabad Award 2008. In the book, he compares life in his birthplace, New Hala in Matiari district, Sindh, to that in New York, where he stayed from 1968 to 1972 while employed with the Pakistan National Shipping Corporation. Before he began writing the book 35 years later, Shaikh revisited the port cities of the US where his ships sailed to remember what they had been like and to see how much they had changed. Some of his books, which are published in Sindhi, Urdu and English, have been set for the B.A and M.A syllabuses in Sindh University and the University of Karachi. 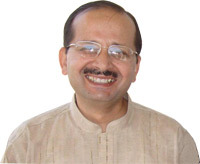 Apart from writing books, Shaikh is a regular columnist for the Pakistan Post, Ummat, Ibrat, Awami Awaz and Kawish (Sindhi) and for the Malaysian newspaper New Straits. However, he is quick credit his wife for all his achievements. "Whenever I had some free time, I would resume writing," he says. "My family was with me on the ship, but my wife knew of my passion. She raised our children and managed all the chores without any complaints. It was because of her patience that I have so many books to my name." Surprisingly though, Mastoora Shaikh has not been able to catch up on most of her husband's writings. "I didn't ever feel the need to read his books," she says with a laugh. "I was always with him during his trips. He shared all his tales with me in person and now he wants to share them with the world."